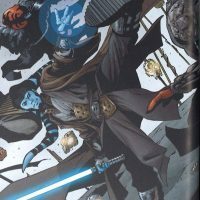 Shado Vao was a male Rutian Twi’lek Jedi Master who was the apprentice of Kol Skywalker and a close friend to Kol’s son, Cade Skywalker during the time of the Sith–Imperial War and the subsequent Second Imperial Civil War against Darth Krayt and the One Sith. Blue coloured skin (matching the lekku). Black Headpiece that covers the head, and approximately the first 1/3 of the lekkus and a part of the face. Black stripes. High, brown leather or leather-like collar with hole – pattern. It is in the front open and will be closed with a small rack at the bottom. Light grey outer tunic with wide sleeves that are covered with bracers at the forearm. Grey sleeveless plaid that lasts at least over the knees and is open on both sides. Same colour as the inner tunic. Same colour as the outer tunic. Brown leather or leather like belt in the same colour as the collar. Big square silver/metal belt buckle, the buckle has 2 level slots, fixed with 2 rivets on each side (like seen on the pictures) 4 square brown pouches. One big leather or leather like tabard with hole-pattern (same colour and pattern like the collar). It covers the whole belly down to the crotch. Brown leather or leather like bracers with hole-pattern (same colour and pattern as collar and tabard) The bracers covers the forearm. On the inner side they are fixed with 2 straps made out of the same material. Black gloves that covers the knuckles up to the forearm. (under the bracers). The fingers are not covered. Blue double bladed lightsaber with silver/metall hilt. (no toy or Ultimate FX sabers allowed).